Earlier this month, the World Bank released the June 2018 edition of the Global Economic Prospects report titled “Global Economic Prospects: The Turning of the Tide?” Overall, the report predicts a slowdown in global growth as investment moderates and financing conditions tighten. On the sub-Saharan Africa front, the report forecasts a 3.1 percent growth rate in 2018, an increase from 2.6 percent in 2017. 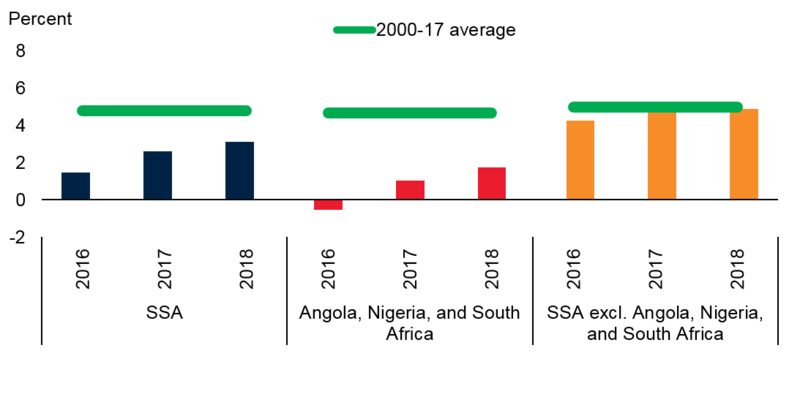 Africa’s largest economies, notably South Africa, Angola, and Nigeria, are recovering and continuing to strengthen largely due to commodity prices stabilizing. Metals production and investment growth has picked up in the region and fiscal deficits are narrowing. The figures in this article show depictions of growth per capita and the narrowing of fiscal deficits. As Figure 1 shows, growth in the region will pick up this year, and remain stable through 2019-2020. These forecasts are made under the assumption that oil and metal prices will remain stable, external financial market conditions will continue to be supportive, and governments in the region will implement reforms to tackle macroeconomic imbalances and boost investment. While the oil sector is expected to continue to support the recovery, oil production will likely be below the levels projected by the government; thus, in Nigeria, growth forecasts are lower than ones made in January. Growth in the non-oil industrial sector is predicted to remain subdued. In Angola, an upward trend reflects the expectation of a more efficient allocation of foreign exchange, rising natural gas production, and improved business sentiments. In South Africa, the pickup in business confidence is expected to help sustain the ongoing recovery in investment. On the fiscal front, African countries have historically hosted high fiscal deficits, resulting in high public debt levels in the region. 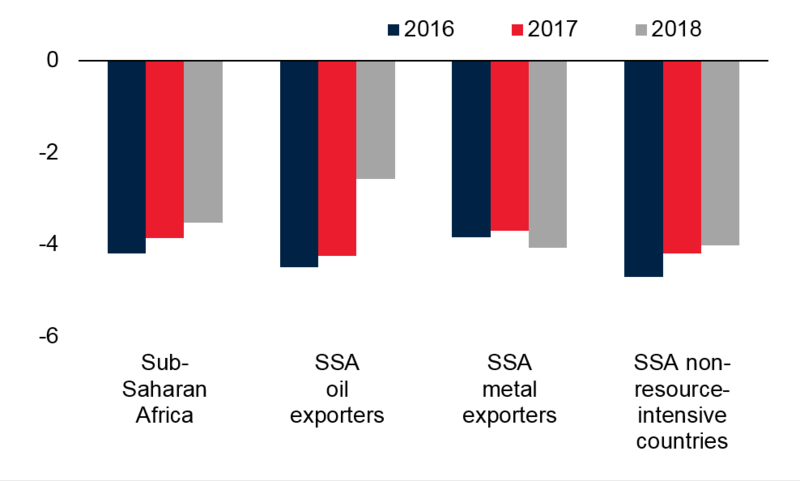 According to the report, median debt levels among metal exporters are rising, potentially reflecting undisclosed borrowing in some cases (e.g., Mozambique) and high public investment in others (e.g., Zambia). As Figure 2 shows, fiscal deficits are narrowing in part due to higher oil prices and an increase in domestic revenue in some cases. Among oil producers, the improvement reflects the recovery in oil prices and public expenditure changes in countries in the Central African Economic and Monetary Community (e.g., Chad, Republic of Congo). However, in metal exporting countries, fiscal deficits are widening, due to weaker domestic revenue mobilization and rising expenditure. In non-resource-intensive countries, where commodity revenues represent a small share of total revenues, domestic revenue has increased, thus contributing to the reduction of the fiscal deficit. Recently, international bonds have started to mature; according to the Financial Times, nearly $25 billion in sovereign debt will mature this year. Large repayments are expected over the period of 2020-2025, which would pose a significant refinancing challenge to the region. Thus, according to the World Bank report, to contain further increases in government debt in the region, sustained fiscal consolidation, higher domestic revenue mobilization, and stronger growth will be necessary.